Coordinates: 26°40′00″N 93°21′00″E﻿ / ﻿26.666667, 93.35 Kaziranga National Park, a national park in the Golaghat and Nagaon districts of Assam, India has World Heritage Site status. Two-thirds of the world's Great One-horned Rhinoceroses live in the park. Kaziranga has the highest density of tigers among protected areas in the world, declared a Tiger Reserve in 2006. The park has large breeding populations of elephants, water buffalo and swamp deer. Birdlife International recognizes Kaziranga as an Important Bird Area for conservation of avifaunal species. The park has achieved notable success in wildlife conservation compared to other protected areas in India. Located on the edge of the Eastern Himalaya biodiversity hotspot, the park combines high-species diversity and visibility. Kaziranga hosts a vast expanse of tall elephant grass, marshland and dense tropical moist broadleaf forests crisscrossed by four major rivers, including the Brahmaputra, and has numerous small bodies of water. Kaziranga has been the theme of several books, documentaries and songs. The park celebrated its centenary in 2005 after its establishment in 1905 as a reserve forest. The Kaziranga National Park, situated in the Lower Himalaya region of India, enjoys a semi-tropical climate, hosting fauna of both temperate and tropical climates. The region experiences three seasons, a mild winter, hot summer and long monsoon season. The lengthy growing season promotes the abundant fauna need to support wild life. Wild life abounds; jungle mammals including tigers and rhinoceros, birds, snakes, aquatic life. Converted from a game park early in its history, the Kaziranga National Park provides the nature lover with a firsthand experience with many creatures on the endangered species list. Though the etymology of the name Kaziranga remains uncertain, a number of possible explanations exist. According to one legend, a girl named Ranga, from a nearby village, and a youth named Kazi, from Karbi Anglong, fell in love. When their families rejected they match, they disappeared into the forest, never to be seen again. Locals then named the forest after them. According to another legend, Srimanta Sankardeva, the sixteenth century Vaisnava saint-scholar, once blessed a childless couple, Kazi and Rangai, and asked them to dig a big pond in the region so that their name would live on. Testimony to the history of the name appears in some records which state that once, while the Ahom king Pratap Singha (seventeenth century) passed by the region, he felt particularly impressed by the taste of fish and on inquiry, he learned it came from Kaziranga. Some historians believe that the name Kaziranga derived from the Karbi Word Kajir-a-rang, meaning "the village of Kajir (kajiror gaon)." Among the Karbis, Kajir commonly refers to the name for a girl child,, with belief that a woman named Kajir once ruled over the area. Fragments of monoliths associated with Karbi rule found scattered in the area seem to bear testimony to that assertion. Kaziranga could also mean the "Land of red goats (Deer)," as the word Kazi in the Karbi language means "Goat," and Rangai means "Red". 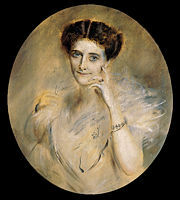 Mary Victoria Leiter, the wife of the Viceroy of India, Lord Curzon, credited with starting the movement for conservation of rhinoceroses. The history of Kaziranga as a protected area traces back to 1904, when Mary Victoria Leiter, the wife of the Viceroy of India, Lord Curzon, visited the area. After failing to spot a rhinoceros, for which the area was renowned, she persuaded her husband to take urgent measures to protect the dwindling species. On June 1, 1905, the Kaziranga Proposed Reserve Forest was created with an area of 232 km² (90 sq mi). Over the next three years, the park area was extended by 152 km² (59 sq mi), to the banks of the Brahmaputra River. 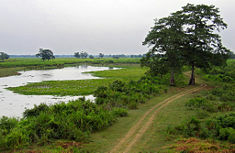 In 1908, the government designated Kaziranga a Reserve forest. In 1916, the Reserve forest converted to a game sanctuary—The Kaziranga Game Sanctuary—and remained so till 1938, when the management prohibited hunting, allowing visitors permitted to enter the park. P.D. Stracey, the forest conservationist, renamed the Kaziranga Game Sanctuary to the Kaziranga Wildlife Sanctuary in 1950 to rid the name of hunting connotations. In 1954, the government of Assam passed the Assam (Rhinoceros) Bill, imposing heavy penalties for rhinoceros poaching. 14 years later, in 1968, the state government passed 'The Assam National Park Act of 1968', declaring Kaziranga a designated national park. The 430 km² (166 mi²) park received official status by the central government on February 11, 1974. 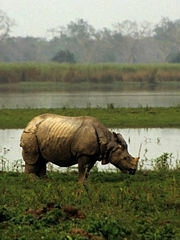 In 1985, UNESCO declared Kaziranga a World Heritage Site for its unique natural environment. Kaziranga has witnessed several natural and man-made calamities in recent decades. Floods caused by overflowing of river Brahmaputra have led to significant losses in animal life. Encroachment by humans along the periphery has also led to a diminished forest cover and a loss of habitat. An ongoing separatist movement in Assam by the United Liberation Front of Asom (ULFA) has crippled the economy of the region, but Kaziranga has remained unaffected by the movement; in fact, instances of rebels from the United Liberation Front of Assam protecting the animals, and in extreme cases killing the poachers, have been reported since the 1980s. The park celebrated its centenary with much fanfare in 2005, inviting descendants of Lord Curzon for the celebrations. In early 2007, two rhinoceros and elephants relocated to Manas National Park, the first instance of relocation of elephants between national parks in India. Kaziranga locates between latitudes 26°30' N and 26°45' N, and longitudes 93°08' E to 93°36' E within two districts in the Indian state of Assam—the Kaliabor subdivision of Nagaon district and the Bokakhat subdivision of Golaghat district. Approximately 40 km (25 mi) in length from east to west, Kaziranga spans 13 km (8 mi) from north to south. Kaziranga covers an area of 378 km² (146 sq mi), with approximately 51.14 km² (20 sq mi) lost to erosion in recent years. A total addition of 429 km² (166 sq mi) along the present boundary of the park has been made and notified with separate national park status to provide extended habitat for increasing population of wildlife or as a corridor for safe movement of animals to Karbi Anglong Hills. Elevation ranges from 40 m (131 ft) to 80 m (262 ft). 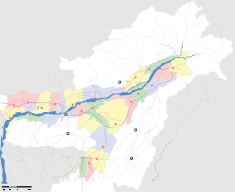 the Brahmaputra River circumscribes the park area, forming the northern and eastern boundaries, while the Mora Diphlu forms the southern boundary. The Diphlu and Mora Dhansiri flow within the park. Kaziranga has flat expanses of fertile, alluvial soil formed by erosion and silt deposition by the Brahmaputra. The landscape consists of exposed sandbars, riverine flood-formed lakes known as beels (which make up 5% of the surface area), and elevated regions known as chapories which provide shelter for animals during floods. Many artificial chapories have been built with the help of the Indian Army for the animals' safety. Kaziranga is one of the largest tracts of protected land in the sub-Himalayan belt, and due to the presence of highly diverse and visible species, has been described as a "biodiversity hotspot". The park sits in the Indomalaya ecozone, and Brahmaputra Valley semi-evergreen forests of the tropical and subtropical moist broadleaf forests biome and a frequently flooded variant of the Terai-Duar savanna and grasslands of the tropical and subtropical grasslands, savannas, and shrublands biome comprise the dominant biomes of the region. The park experiences three seasons: summer, monsoon, and winter. The winter season, between November and February, experiences mild and dry weather, with a mean high of 25 °C (77 °F) and low of 5 °C (41 °F). During that season, beels and nallahs (water channels) dry up. The summer season between March and May becomes hot, with temperatures reaching a high of 37 °C (99 °F). During that season, animals usually gather near water bodies. :p.06 The rainy monsoon season lasts from June to September, giving Kaziranga most of its annual rainfall of 2,220 mm (87 in). During the peak months of July and August, three-fourths of the western region of the park submerge due to the rising water level of the Brahmaputra. The flooding causes most animals to migrate to elevated and forested regions outside the southern border of the park, such as the Mikir hills. Occasional dry spells create problems as well, such as food shortages for the wildlife in the park. Two-thirds of the world's Great One-horned Rhinoceroses live in the park. Kaziranga contains significant breeding populations of 35 mammalian species, of which 15 are threatened as per the IUCN Red List. The park has the distinction of being home to the world's largest population of the Great Indian One-Horned Rhinoceros (1,855), Wild Asiatic Water Buffalo (1,666) and Eastern Swamp Deer (468). Significant populations of large herbivores include elephants (1,940), gaur (30) and sambar (58). Small herbivores include the Indian Muntjac, wild boar and hog deer. Kaziranga represents one of the few wild breeding areas outside Africa for multiple species of large cats such as Indian Tigers and Leopards. The Indian government declared Kaziranga a Tiger Reserve in 2006 and has the highest density of tigers in the world (one per five km²), with a population of 86, as per the 2000 census. Other felids include the Jungle Cat, Fishing Cat and Leopard Cats. Small mammals include the rare Hispid Hare, Indian Gray Mongoose, Small Indian Mongooses, Large Indian Civet, Small Indian Civets, Bengal Fox, Golden Jackal, Sloth Bear, Chinese Pangolin, Indian Pangolins, Hog Badger, Chinese Ferret Badgers and Particolored flying squirrels. Nine of the 14 primate species found in India occur in the park. The Assamese Macaque, Capped, Golden Langur, as well as the only ape found in India, the Hoolock Gibbon stand out. Kaziranga's rivers constitute home to the endangered Ganges Dolphin. Birdlife International has declared Kaziranga an Important Bird Area. Kaziranga serves as home to a variety of migratory birds, water birds, predators, scavengers and game birds. Birds such as the Lesser White-fronted Goose, Ferruginous Duck, Baer's Pochard duck and Lesser Adjutant, Greater Adjutant, Black-necked Stork and Asian Openbill stork migrate from Central Asia to the park during winter. Riverine birds include the Blyth's Kingfisher, White-bellied Heron, Dalmatian Pelican, Spot-billed Pelican, Spotted Greenshank and Black-bellied Tern. :p.10 Birds of prey include the rare Eastern Imperial, Greater Spotted, White-tailed, Pallas's Fish Eagle, Grey-headed Fish Eagle, and the Lesser Kestrel. Kaziranga, once home to seven species of vultures that nearly reached extinction, possibly by feeding on animal carcasses containing the drug Diclofenac. Only the Indian Vulture, Slender-billed Vulture, and Indian White-rumped Vulture have survived. Game birds include the Swamp Francolin, Bengal Florican and Pale-capped Pigeon. Other families of birds inhabiting Kaziranga include the Great Indian Hornbill and Wreathed Hornbill, Old World babblers such as Jerdon’s and Marsh Babblers, weaver birds such as the common Baya Weaver, threatened Finn's Weavers, thrushes such as Hodgson's Bushchat and Old World warblers like the Bristled Grassbird. Other threatened species include Black-breasted Parrotbill and the Rufous-vented Prinia. Two of the largest snakes in the world, the Reticulated Python and Rock Python, as well as the longest venomous snake in the world, the King Cobra, inhabit the park. Other snakes found here include the Indian Cobra, Monocled Cobra, Russell's Viper and the Common Krait. Monitor lizard species found here include the Bengal monitor and the Water Monitor. Other reptiles include 15 species of turtle, such as the endemic Assam Roofed Turtle and one species of tortoise, the Brown Tortoise.At least 42 species of fish live in the area including the Tetraodon. Four main types of vegetation types exist in the park: alluvial inundated grasslands, alluvial savanna woodlands, tropical moist mixed deciduous forests and tropical semi-evergreen forests. Based on Landsat data for 1986, tall grasses covers 41 percent, short grasses 11 percent, open jungle 29 percent, swamps 4 percent, rivers and water bodies 8 percent, and sand 6 percent. A difference in altitude exists between the eastern and western areas, with the western side at a lower altitude. Grasslands dominate the western reaches of the park. Tall elephant grass grows on higher ground, while short grasses cover the lower grounds surrounding the beels or flood-created ponds. Annual flooding, grazing by herbivores and controlled burning maintains and fertilizes the grasslands and reeds. sugarcanes, spear grass, Elephant Grass and the Common Reed comprise the common tall grasses. Numerous forbs grow along with the grasses. Trees—dominant species including Kumbhi, Indian gooseberry, the cotton tree (in savanna woodlands), and Elephant apple (in inundated grasslands) scatter amidst the grasses, providing cover and shade. Thick evergreen forests, near the Kanchanjhuri, Panbari and Tamulipathar blocks, contain trees such as Aphanamixis polystachya, Talauma hodgsonii, Dillenia indica, Garcinia tinctoria, Ficus rumphii, Cinnamomum bejolghota, and species of Syzygium. Tropical semi-evergreen forests thrive near Baguri, Bimali and Haldibari. Albizia procera, Duabanga grandiflora, Lagerstroemia speciosa, Crateva unilocularis, Sterculia urens, Grewia serrulata, Mallotus philippensis, Bridelia retusa, Aphania rubra, Leea indica and Leea umbraculifera number among the common trees and shrubs. Many different aquatic floras grow in the lakes, ponds and along the river shores. The ubiquitous invasive Water Hyacinth often chokes the water bodies, clears during destructive floods. Kaziranga staff, with help from the Wildlife Trust of India, cleared another invasive species, Mimosa invisa, toxic to herbivores, in 2005. The Wildlife wing of the forest department of the Government of Assam bears responsibility for the administration and management of Kaziranga, headquartered at Bokakhat. The administrative head, a conservator-level officer, serves as the park the director. A divisional forest officer serves as the administrative chief executive of the park, assisted by two officers with the rank of assistant conservator of forests. The park area divides into four ranges, overseen by range forest officers. The four ranges, the Burapahar, Baguri, Central, and Eastern, maintain headquarters at Ghorakati, Baguri, Kohora, and Agoratoli, respectively. Each range further sub-divides into beats, headed by a forester, and sub-beats, headed by a forest guard. The park receives financial aid from the State Government as well as the Ministry of Environment and Forests of Government of India under various Plan and Non-Plan Budgets. The Central Government provides additional funding under the Project Elephant. In 1997–1998, the park received a grant of US$ 100,000 under the Technical Co-operation for Security Reinforcement scheme from the World Heritage Fund. National & international Non-governmental organizations provide additional funding. Kaziranga National Park has been granted maximum protection under the Indian law for wildlife conservation. Various laws, including the Assam Forest Regulation of 1891 and the Biodiversity Conservation Act of 2002, have been enacted for protection of wildlife in the park. Poaching activities, particularly of the rhinoceroses for its horn, has been a major concern for the authorities. Between 1980 and 2005, poachers killed 567 rhinoceroses. Following a decreasing trend for the past few years, poachers killed six one-horned rhinoceroses in early 2007. Reports have suggested links between those poaching activities and funding of Islamic militant groups in Bangladesh connected to Al Qaida. Preventive measures such as construction of anti-poaching camps and maintenance of existing ones, patrolling, intelligence gathering and control over the use of firearms around the park have reduced the number of casualties. Perennial flooding and heavy rains have resulted in death of wild animals and damage to the conservation infrastructures. To escape the water-logged areas, many animals migrate to elevated regions outside the park boundaries, making them susceptible to hunting, hit by speeding vehicles, or subject to reprisals by villagers for damaging their crops. To mitigate the losses, the authorities have increased patrols, purchased additional speedboats for patrol, and created artificial highlands for shelter. Several corridors have been set up for the safe passage of animals across National Highway–37 which skirts around the southern boundary of the park. To prevent the spread of diseases and maintain the genetic distinctness of the wild species, the park management take systematic steps periodically such as immunization of livestock in surrounding villages, and fencing of sensitive areas of the park susceptible to encroachment by local cattle. Water pollution due to run-offs from pesticides from tea gardens, and a petroleum refinery at Numaligarh, pose a hazard to the ecology of the region. Invasive species such as Mimosa and wild rose have posed a threat to the native plants in the region. Regular manual uprooting, weeding, and research on biological methods for controlling weeds before seed settling controls the growth and irradiation of invasive species. The park administration uses grassland management techniques, such as controlled burning annually to avoid forest fires. Observing the wildlife, including birding, constitutes the main visitor activity in and around the park. The park management allow only elephant or jeep tours; hiking has been prohibited to avoid attacks by animals. Observation towers, situated at Sohola, Mihimukh, Kathpara, Foliamari and Harmoti, provide wildlife viewing. The Lower Himalayan peaks frame the park's landscape of trees and grass interspersed with numerous ponds. An interpretation centre, under construction at the Bagori range of Kaziranga, will help visitors learn about the park. The park remains closed for visitors from mid-April to mid-October due to monsoon rains. The Department of Environment and Forests, Government of Assammaintain four tourist lodges at Kohora and three tourist lodges inside the park. Private resorts operate outside the park borders. Increased tourism has brought an improvement in the standard of living for people living on the fringes of the park. Authorized forest department guides accompany all travellers inside the park. Visitors book Mahout-guided elephant rides and Jeep or other four-wheel drive vehicles rides in advance. Starting from the Park Administrative Centre at Kohora, those rides follow the three roadways under the jurisdiction of three ranges—Kohora, Bagori and Agaratoli. Those trails accept light vehicles from November to mid May. Visitors may bring in their own vehicles only when accompanied by guides. Buses owned by Assam State Transport Corporation and private agencies between Guwahati, Tezpur and Upper Assam stop at the main gate of Kaziranga on NH-37 at Kohora. Bokakhat, the nearest town, lies 23 kilometers (14 mi) away. Major cities nearby include Guwahati (217 kilometers (135 mi)) and Jorhat (97 kilometers (60 mi)). Furkating 75 kilometers (47 mi), under the supervision of Northeast Frontier Railway, has the nearest railway station. Jorhat Airport at Rowriah (97 kilometers (60 mi) away), Tezpur Airport at Salonibari (approx 100 kilometers (62 mi) away) and Lokpriya Gopinath Bordoloi International Airport in Guwahati (approximately 217 kilometers (135 mi) away) provide the closest airports. Kaziranga has been the theme, or has been mentioned in, several books, documentaries, and songs. The park first gained prominence after Robin Banerjee (a doctor turned photographer and filmmaker) produced a documentary titled Kaziranga, airing on Berlin television in 1961 and became a runaway success. American science fiction and fantasy author, L. Sprague de Camp wrote about the park in his poem, "Kaziranga, Assam," first published in 1970 in Demons and Dinosaurs, a poetry collection, and reprinted as "Kaziranga" in Years in the Making: the Time-Travel Stories of L. Sprague de Camp in 2005. Kaziranga Trail (Children's Book Trust, 1979), a children's storybook by Arup Dutta about rhinoceros poaching in the national park, won the Shankar's Award. The Assamese singer Bhupen Hazarika refers to Kaziranga in one of his songs. The BBC conservationist and travel writer Mark Shand authored a book and the corresponding BBC documentary Queen of the Elephants, based on the life of the first female mahout in recent times—Parbati Barua of Kaziranga. The book went on to win the 1996 Thomas Cook Travel Book Award and the Prix Litteraire d'Amis, providing publicity simultaneously to the profession of mahouts, and to Kaziranga. ↑ 27.0 27.1 Kaziranga, Kolkata Birds, Retrieved on 2007-04-08. ↑ S.K. Jain and A.R.K. Sastry. Botany of some tiger habitats in India. (Howrah: Botanical Survey of India, 1983), 71. ↑ B.S. Bonal & S. Chowdhury, Evaluation of barrier effect of National Highway 37 on the wildlife of Kaziranga National Park and suggested strategies and planning for providing passage: A feasibility report to the Ministry of Environment & Forests. (Government of India, 2004). BBC Documentary Queen of the Elephants.' Discovery Channel DVD. Cnservationist Mark Shand and elephant handler Parbarti Barua. Choudhury, Anwaruddin. The Birds of Assam. Guwahati: Gibbon Books and World Wide Fund for Nature, 2000. ISBN 9788190086615. __________. Birds of Kaziranga National Park: A checklist. Guwahati: Gibbon Books and The Rhino Foundation for Nature in NE India, 2003. ISBN 9788190086639. Dutta, Arup Kumar. Kaziranga Trail. Children's Book Trust, India, 1979. ISBN 0861443799. Jaws of Death (2005). documentary by Gautam Saikia about Kaziranga animals being hit by vehicular traffic while crossing National Highway 37, winner of the Vatavaran Award. Khorana, Meena. The Indian Subcontinent in Literature for Children and Young Adults: An Annotated Bibliography of English-Language Books. Greenwood Press, 1991. Oberai, C.P., B.S. Bonal. Kaziranga: The Rhino Land. : New Delhi: B.R. Publishing, 2002. ISBN 9788176462594. Shand, Mark. Queen of the Elephants. London; New York:: Vintage; New Ed. 1996. Kaziranga National Park in UNESCO World Heritage List. History of "Kaziranga National Park"
This page was last modified on 15 April 2018, at 20:40.